Whales, which have been hunted for centuries, are still recovering from industrial whaling. They are also confronted to new threats: bycatch in fishing nets, habitat degradation, pollution, diseases, climate change, underwater noise, etc. As a consequence of the globalization of maritime trade and the development of passenger transport, another anthropogenic threat has emerged for whales worldwide: collisions with vessels. In the title of this article, we use the term vessel because all types of crafts are involved, not only commercial ships but also passenger ferries and sailing boats. However, the term generally used is ship strikes and we will use it below. While ship strikes are also dealt with in other organizations, one particular international organization has strongly embarked on addressing the issue: the International Whaling Commission (IWC) whose membership has grown to 89 countries. Work started in 2005 through the Ship Strikes Working Group convened and chaired by Belgium. As of today, 16 countries are part of the group. Since 2005, several concrete steps have been taken: the development of a standardized database of ship strikes to enable reporting and analysis of the causes and extent of the problem; awareness raising in the maritime industry, through putting ship strikes on the agenda of the International maritime Organization (IMO) and obtaining IWC observer status at the IMO; presentations are also made in conservation fora and maritime academies; organization of a regional workshop on reducing the risk of ship strikes in the Mediterranean Sea and the Canary Islands. Ship strikes with whales can also provoke damage to ships, especially high-speed ferries and, in some countries, national regulation includes substantial penalties (between 16.500 and 49.500 USD) for non compliance with speed limits. In this article, we would like to focus on the recommendations issued at the workshop co-organized by the IWC and ACCOBAMS in Beaulieu-sur-Mer (France) from 21 to 24 September 2010. We will also give some information on the 2nd Marine Conservation Forum held in Abu Dhabi, where ship strikes were on the agenda. The geographical focus of this first workshop on ship strikes mitigation has been chosen given the amount of data available for these regions. It was also felt that a regional approach provides better opportunities for follow-up actions. The Beaulieu workshop was attended by government representatives, scientists, NGOs and representatives of the shipping industry. Other regional workshops should be organized on the model of this first event which i.a. facilitated the start of a joint project between a shipping company and WWF, on a decision-support system for cetacean avoidance. The Beaulieu workshop reviewed information on ship strikes in the two focus regions and assessed different types of mitigation measures. The workshop issued recommendations for priority species and areas; six risk areas are considered as priority for collecting data: the Strait of Gibraltar, the Pelagos Sanctuary (Ligurian Sea), the area south west of the island of Crete, the area around the Balearic Islands, the area between Almeria and Nador at the eastern side of the Alboran Sea and the Canary Islands. While any mitigation measures should only be taken after quantification of the expected risk reduction, the workshop discussed strengths and weaknesses of five different measures. Where practical, vessels should be separated from whales using measures such as Areas To Be Avoided and Traffic Separation Schemes. Where it is not possible to do so, speed should be reduced when and where whales are present. In the US, in order to protect right whales of the Eastern seaboard, a 10 knots speed limit has been implemented for vessels 65 feet and greater. Also under US regulation, mandatory ship reporting systems are used to inform approaching ships of whale presence. Dedicated observers can be most efficient on board smaller vessels, including high-speed ferries which can manoeuver more easily to avoid a collision. Technological approaches were also considered, in particular the recently launched REPCET system which, through dedicated observers, plots whale sightings and transmits alerts through satellite to vessels equipped with REPCET. Finally, the workshop also called for mandatory ship strikes reporting in the Canary Islands where the high-speed ferries traffic is intense. The workshop recommendations will be discussed at the next IWC annual meeting in Jersey (5-14 July 2011). Awareness raising in the Arabian Peninsula: The Arabian Sea humpback whales at risk? 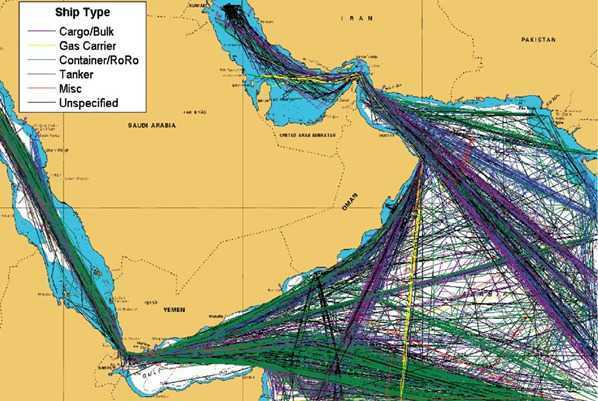 The author of this article gave a presentation on ship strikes at the second regional Marine Conservation Forum held in Abu Dhabi on 14-16 December 2010. Among other whale species present in the region, there is a population of humpback whales with only 82 animals. Additional research is needed to assess the threats to this population in a region of intense maritime traffic. On top of general recommendations applicable globally (see above), specific recommendations were made in relation to ship strike mitigation and endorsed at the Forum: utilization of existing training modules, such as the module developed by NOAA (USA); integration of marine awareness modules in the programs of maritime academies of the region; participation of local scientists to capacity building workshops for whale stranding network coordinators. Ship strikes can be considered as just one issue which provides an opportunity for the maritime community to pursue greater awareness of and care for the marine environment. Such changed approach will make our seas safer and healthier for the various members of the maritime community. The cooperation of the maritime industry and authorities will be key to implement the right measures.